By Robert Higgs on Sunday, October 24th, 2010 at 12:15 p.m.
With just over a week to go before Election Day, candidates in key races across Ohio are showing no signs of letting up on each other. Recent polls have the governor's race as a tossup. Several of the other statewide races remain close. And some key congressional races could play a big role in determining which party controls the House of Representatives in January. As candidates, and their surrogates, continue to slug it out on the airwaves and in campaign mailings, truth sometimes is becoming a casualty. More than half the statements that PolitiFact Ohio reviewed in the last week got a rating of False. Busted budget destroyed jobs: Republicans have made jobs the central theme of the campaign, and "400,000" -- an aptly titled TV ad from GOP gubernatorial candidate John Kasich -- dutifully delivers its refrain: "Under Ted Strickland as governor, Ohio has lost nearly 400,000 jobs." That number has been bandied about a lot this election, but in "400,000," Kasich's pitchman, a burly fellow with a white hardhat tucked under his arm, goes a step further. He says: "Ted Strickland destroyed Ohio jobs when he busted the budget and raised our taxes to help pay for his mistakes." PolitiFact Ohio examined the front part of that statement, that Strickland destroyed jobs when he busted the budget, rating the claim False. When asked to back up the claim, the Kasich campaign told PolitiFact Ohio that Strickland reneged on a pledge not to raise taxes after a plan to cover a budget shortfall with new revenue generated from slot machines at Ohio's horse tracks fell through. But that didn't explain what "busted the budget" means, or how Strickland busted it. Ohio law requires that the state budget be balanced, and the governor shares authority for it with the General Assembly. Legislators voted to support the governor's plan to stall a tax rollback after a court blocked the slots plan. And together legislators and Strickland put a balanced budget into effect. PolitiFact Ohio looked at a statement Portman made during one of the three debates between the two candidates, a statement that criticized Fisher for inefficient use of job-training money. "Under Lt. Gov. Lee Fisher, Ohio is 44th in the country in terms of getting money actually into worker retraining," Portman charged. "Over $3 billion a year comes into Ohio from the federal government. That money is not well spent." But this claim, too, was rated False. PolitiFact Ohio found that the numbers Portman cited came from a report that, in part, examined a time frame that predated Fisher taking office. Also, the report covered only one part of the universe of worker retraining programs. And Ohio subsequently made changes in job training that significantly improved how it got money into individual worker retraining accounts. The taint of corruption: Ohio's Republican Party took aim at Democrat Maryellen O'Shaughnessy in a campaign mailing that tried to link the secretary of state candidate to the Cuyahoga County corruption probe. O'Shaughnessy, the ad said, "accepted campaign cash from indicted politician Jimmy Dimora." 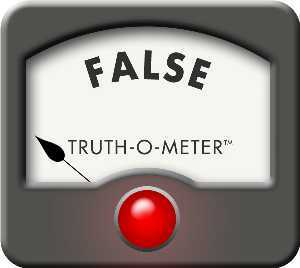 PolitiFact Ohio found that Dimora's campaign in fact did give $100 to an O'Shaughnessy campaign. And Dimora, a county commissioner, has been indicted on 23 federal charges. But the two facts don't mesh as the flier would have one believe. O'Shaughnessy got the donation June 25, 2008, a month before the federal investigation became public and agents raided Dimora's home and office. At the time, O'Shaughnessy was not a candidate for secretary of state but was running for Franklin County clerk of courts. Using the term "indicted politician" implies that O'Shaughnessy accepted money from Dimora after he was indicted. Dimora, who maintains his innocence, wasn't indicted until September 2010. PolitiFact Ohio rated this claim False.